If you need to find the best mattress for arthritis but you don’t have enough time to go through a lot of detailed information on this subject, then this article will definitely be useful. We have carefully researched this category and reviewed a large number of products, while also considering expert opinions and market data, to reach the conclusion that the mattress you should take into consideration as the first option should be Sealy’s 8-Inch model. Built to last for many years, this model offers your body the support and alignment it needs for an improved posture, thus relieving various types of pains. Moreover, since it’s a medium-firm mattress, it can adapt to all sleeping positions, and the memory foam layer adapts to the body’s shape. If unfortunately, you cannot find this product available in your area, the next option you should keep in mind is Layla Sleep’s Queen mattress. Specially made to ensure the user’s overall comfort, this mattress offers the necessary support and helps relieve pains that might otherwise keep you up at night, particularly those caused by arthritis. This is a medium-firm model, so it adapts to all types of sleeping positions. Some users consider this to be a bit too firm, while others are saying exactly the opposite. However, this perception depends on your preferences and body type as well. Ensuring pressure relief and support, while also hugging your body thanks to its adaptive memory foam, this mattress is one you should definitely try out. Featuring a copper-infused cooling system, this mattress includes different technologies to ensure the user’s comfort and rest. Plus, its two sides have different firmness levels, so you can choose between them, while the Thermo Gel technology prevents overheating. For some previous buyers, this model seems to be a bit too firm. Also, you might need to air it, since it could have a particular smell straight out of the box. Incorporating various technologies to ensure the highest level of comfort and support, Layla Sleep’s model is a very good alternative to consider. What sets this mattress apart is the fact that it effectively distributes equalized pressure over its surface, this way ensuring a proper support and spine alignment. Since it features a motion isolation technology, you won’t feel another person’s movements during the night. You should be aware that this mattress is a rather heavy one, especially for those with less physical strength, so it might be difficult to maneuver when you change the sheets. Given that it ensures the right spinal alignment when you sleep on your back or on your side, this Purple mattress is a very good choice for your next purchase. In case you’ve already spent some time looking for the best type of mattress for arthritis sufferers, then you surely know that there are many alternatives you can choose from. If you are feeling somewhat overwhelmed by this, then the following selection is here to help, since it features our favorite picks from the highest-rated products currently available for sale. We know that when it comes to arthritis and mattresses, you have to carefully choose a model that suits your needs to help you get rested and ready for the next day. For this reason, Sealy’s 8-Inch product made it to our selection, given that it offers plenty of benefits, so don’t hesitate to take a look at it. This high-density memory foam mattress is built to last for many years to come while offering your body constant support, night after night. Since it features a winning combination of certified materials, you can be sure you’ll enjoy both an excellent pressure relief, as well as support and conformity that feels like it hugs your body. Since it’s a medium-firm feel mattress, it works very well for all sleeping positions, while the 2-inch premium memory foam layer adapts to your body’s shape ensuring full comfort. Moreover, another 6-inch conventional foam layer promotes a cooling airflow. Another good mattress for arthritis that you should keep in mind is Layla Sleep’s Queen model. This product features a copper-infused cooling system for a comfortable sleep, as well as variable support for most sleeping positions. Plus, since it’s specially made with versatility in mind, its two sides have different firmness levels. The first one is medium-soft, while the other is firm, so you basically get two types of mattresses in one product. Moreover, since comfort at all times is key for being truly rested, this mattress includes a Thermo Gel technology that actually reacts to the body’s temperature, this way keeping you from getting too warm throughout the night. The manufacturer also took convenience in terms of delivery into account, which means that this product is compressed, rolled, wrapped, boxed, and delivered right to your doorstep so you have nothing to be concerned about in terms of getting it into the house. If you are in the market for a mattress for arthritis, then you are most probably well aware of the fact that products in this category should come with many other benefits besides ensuring support. The good news is that Purple’s model definitely fits the bill, and we do have to mention that this king size mattress distributes equalized pressure, offering the proper support and spine alignment. According to the manufacturer, this model ensures the ultimate sleeping experience and, given that quality sleep is vital for anyone’s overall health and happiness, this mattress might prove to be that enabler you’ve been waiting for. The model features the motion isolation technology which equalizes pressure from the body’s weight, thus reducing any movement you might feel from someone else sleeping next to you. Also, the Free Air Flow technology uses breathable channels to keep heat away from your body, for full comfort throughout the night. 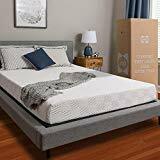 Handcrafted in the United States and made of 100% natural Talalay latex, this Zenhaven model is one to take into consideration if you are looking for a mattress for arthritis in your lower back, but you also want a product that offers you comfort on every level during the night. Another aspect you might want to know is that this mattress is layered with breathable 100% organic wool, as well as wrapped in lush organic cotton. What this means is that you’ll actually find new levels of comfort and health, while the mattress itself is highly durable. Plus, the manufacturer’s exclusive Guardin botanical and antimicrobial fabric treatment also ensures that you’ll be able to enjoy this lush and unbelievably comfortable mattress for a long time. This model’s construction, the materials used, and their treatment ensure that it’s resistant to mold, mildew, and invasive insects or allergens, for a natural, safe, and comfortable sleeping experience. As you go through various reviews of mattresses for arthritis, you might realize that finding the right one can be harder than expected, since there are so many alternatives you can choose from. However, you shouldn’t overlook a mattress such as Nectar’s Queen model, since it features a construction that relieves the body from aches and pains. Another aspect you might want to be aware of is that this mattress also offers the optimal level of firmness, breathability, and coolness, this way paving your way to a great sleeping experience. The great part about it is that is molds to your body, while also being firm enough for the necessary support. Its fabric and construction ensure that even on very warm nights you will be cool and able to get a good rest, as this mattress gently controls heat for an ideal temperature. Plus, this model comes with two additional premium Nectar pillows. Saatva’s goal is a simple but great one, namely to offer its customers quality while saving time and money, and you should not doubt that this goal is achieved with the Luxury Innerspring mattress. This model is specially designed to provide perfect contouring which translates into a restful night’s sleep. Thanks to the advanced coil-on-coil construction and enhanced lumbar support, you don’t need to look any further for a reliable solution to relieve from arthritis pains. Moreover, if you are interested in protecting the environment as well, then you’ll be happy to know that this model is designed to be as eco-friendly as possible. The organic cotton pillow top, as well as the recycled steel coils and antimicrobial treatment ensure that this mattress is extremely comfortable and durable, while not using any chemicals. In terms of delivery, the manufacturer refuses to compress the mattresses, instead shipping them and having them installed right in your home. For those of you who are looking for one of those great mattress toppers for arthritis sufferers, we might have found the right solution, given that Electrowarmth’s M60Fd product consists of heated mattress pads that radiate heat from below. What this means is a deep and restful sleep for the user. The pads ensure a continuous and even bed temperature throughout the night, and this definitely helps relieve various pains. If you’ve been looking for the best mattress for arthritis and fibromyalgia and you’ve already chosen a model, you might want to also consider this product, since it can enhance the results you can get on the long term. Made of 100% polyester, these warming pads come equipped with two comfort controls that allow the user to adjust temperatures for each side of the bed, while the different levels increase from lo and 2 to 9 and hi settings. For an improved sleeping experience, you should try out Milliard’s 2” Gel Infused memory foam mattress topper. In case you’re wondering what benefits this product can bring you, let’s just say that the reduced spine pressure and minimized pains are just some, but not all of them. This topper is able to capture and then distribute heat, while also allowing a proper air flow, this way ensuring an even sleeping temperature and an overall enhanced experience. Moreover, since it’s resistant to allergens, bacteria, mold, and dust mites, this topper works great for users who suffer from asthma or allergies. With a luxurious 2-inch thickness, this product is specially made to contour the body’s shape for enhanced comfort and a better sleep. Plus, you can rely on its therapeutic qualities, since it can help relieve muscle, joint, or arthritis pains, while its high-quality construction means you’ll be able to use it for a long time. In case you don’t want to get rid of your old mattress, but you are looking for ways to improve it, Milliard’s Egg Crate topper can be the right choice for you. This product adds supple texture and support to any type of mattress for a premium level of comfort, given that it acts like a mini-mattress. Once placed on top of your old mattress, you’ll see that this model ensures the body-contouring properties of typical and usually more expensive memory foam mattresses, while using the existing one for support. Since it features an egg crate texture that compresses under different points of contact, it provides additional support while also lifting the areas of lesser contact, this way naturally restoring your posture. What this additional and evened out support also does is that it prevents soreness and relieves various types of pains. An improved circulation can also be added to the list of benefits. You can instantly add a new and more comfortable layer to your mattress if you decide to give this LINENSPA’s model a try. Thanks to its soft and supportive memory foam construction, it distributes weight evenly, thus relieving pressure points and offering you the good night’s and pain-free rest that you need. Moreover, since it’s infused with gel that captures and distributes heat, it prevents overheating so you can enjoy a good sleep the entire night, while the CertiPUR-US certification is yet another reason to give this high-quality product a try. You can successfully revitalize your mattress with this topper, while also enhancing its therapeutic properties so you can get the pain-free sleep you need. The product is available in 2 or 3-inch profile options so you can choose the one that works for your needs. The thicker version hugs your body more, but both profiles have the same plush feel. You are already aware of the importance of sleeping in a comfortable bed and with a great mattress to get the rest that you need to be ready for a new day full of activities. However, you might not be aware that arthritis is among the leading causes of sleep disturbances. Although this physical condition can be very painful and difficult to treat, there are some things that you can do to improve your or a loved one’s experience. One of the solutions is to look among the most sought-after models on the market and choose the one that suits your needs. If you are looking for the best mattress for arthritis pain, then make sure that you find that model that responds to your or your family member’s particular condition by offering the necessary support in order to enjoy its benefits. Arthritis and joint pains have different causes and can manifest in various forms, and a custom engineered product can definitely help alleviate pains. If you are not sure what characteristics to take into consideration, especially if you are looking for something in particular, such as the best mattress for seniors with arthritis, then this guide will come in handy. We’ve listed the main aspects of an effective product to give you a hand. Before going into more details, it’s important to state one of the main characteristics of a good mattress, namely providing a flat and even surface that also ensures close conforming to the body’s shape in order to alleviate pressure and pain in different areas. When we talk about support, we are talking about how well the surface resists the sleeper’s body by maintaining a flat level surface. Excessive firmness or softness are to be avoided, especially when you are looking for the best mattress for arthritic hips, but you should be aware that this support depends on the sleeper’s weight as well. The term ‘conforming’ refers to the way some models can mold according to someone’s body, this way aligning the spine and alleviating pain in various sensitive areas. If a mattress is not as closely conforming, it might lead to a lack of support, this way increasing pain and pressure. As we’ve mentioned, support and firmness are closely related to the user’s overall weight, and there are three general categories you can choose from, although more details should be provided by each manufacturer or seller. A soft mattress is one that most sleepers can sink deeply into, usually being the right solution for those who weigh less than 130 pounds. The medium alternative means that some sleepers will sink into it and this option usually offers the optimal support for most weight ranges. However, it’s not necessarily suitable for users over 230 pounds. This takes us to the third category, namely firm mattresses which are suitable for heavier sleepers. If lightweight users try this alternative out, they might experience pain due to the lack of conforming. Among the other factors that define a good mattress, durability is not one to be overlooked. You already know that these items are not the cheapest ones, so you want to make sure that you go for a high-quality product that will last for as long as possible. The average mattress should perform for at least 6 years before it needs to be replaced, with some models going as far as 8 or 9 years. What you want to avoid, especially when it comes to arthritis, is dealing with sagging and indentations that appear after a short while, as these can increase pain and pressure. Among other factors that ensure comfort, there’s one that’s particularly important for users who are dealing with arthritis, and this is the motion isolation. Since these sleepers often experience pain during the night, they are also sensitive to motions in bed, so a mattress designed to absorb movements, isolating them to a certain area of the sleep surface is definitely a good idea.